Forest soil conditions can be affected by ground-based harvesting; the degree of impact depends upon management factors, location of stands, soil, and topographical conditions. 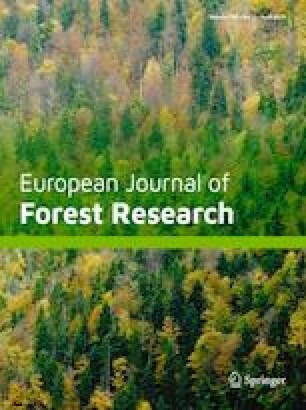 The present study predicted the area and extent of the disturbance of forest soil using soil data collected from 39 ground-based working areas. Random sampling was used to lay out 351 circular sample plots, each with a radius 10 m and located within 39 working areas, before the beginning of logging operations. Data regarding local conditions including stand characteristics, terrains, physical and mechanical properties of the soil, and extraction method was collected and used as predictor variables. Soil compaction, displacement, and rutting were defined as the response variables and were measured post-harvest. The results showed that E-value, cone index, and extracted volume had the most effect on the area of compaction. The lowest soil displacement was recorded at gentle slope and extracted volume of less than 5 m3/ha in clay–loam soil. Rutting of clay soil was most effectively predicted using E-value, slope, and extracted volume. A geospatial-explicit predictive model of soil disturbance was developed using a generalized additive model by implementation of generalized regression analysis and spatial prediction. Land types susceptible to detrimental soil disturbance during ground-based harvest operations were depicted geospatially by GIS. The models can be used as a decision support tool to predict forest harvesting impacts on soil properties. Communicated by Eric R. Labelle.